Reading the NHS Long Term Plan (LTP), the GP Partnership Review, and the Planning Guidance for 2019/20 (not something I would recommend for a single sitting! ), one thing stands out for general practice above everything else – Primary Care Networks. 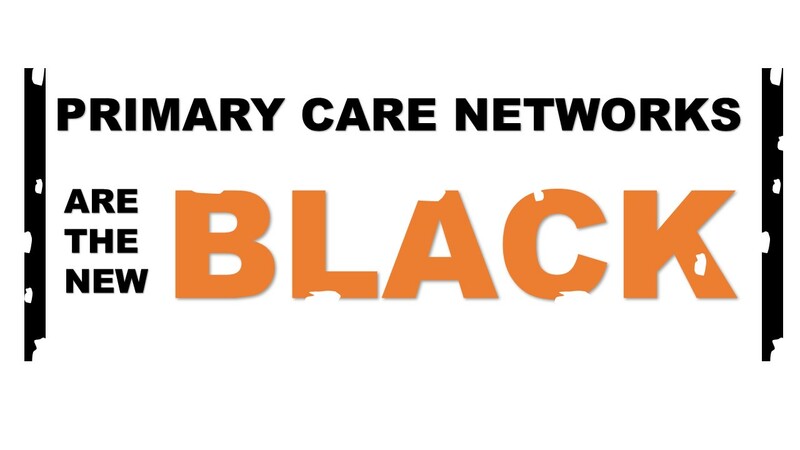 When it comes to general practice, the documents make it clear that Primary Care Networks, based on neighbouring GP practices that work together typically covering 30-50,000 people, are the new black. They are seen as the enabler of “fully integrated community based healthcare” (LTP p15). They will have expanded neighbourhood teams, which “will comprise a range of staff such as GPs, pharmacists, district nurses, community geriatricians, dementia workers and AHPS such as physiotherapists and podiatrists/chiropodists, joined by social care and the voluntary sector.” (LTP p14). And not just an enabler of integration. The GP Partnership Review wants more. It says, “Multi-professional community health teams should be based in Primary Care Networks and work under the clinical and service direction of the Primary Care Network. They could remain employed by their existing employer while being more closely partnered with, and embedded in, practices day to day. This should include creating a single team using a common health record, sharing the same caseload, and removing the need for referrals. Wherever possible, the community teams should also be co-located with the constituent practices of the network.” (Partnership Review 4.46 p30). The future role of Primary Care Networks does not stop there. They are the vehicle for online consultations: digital-first primary care is to become a new option for every patient, and to enable this the NHS, “will create a new framework for digital suppliers to offer their platforms to Primary Care Networks on standard NHS terms” (LTP p26). The GP Partnership Review recommends an even stronger role in relation to access, “Primary Care Networks should be enabled to determine how best to address the balance between urgent and routine appointments during extended opening hours and weekends…NHS England should consider how existing funding for extended access and opening could be allocated through Primary Care Networks as they mature, to enable local decision making on managing demand appropriately” (Partnership Review p32). They should be training hubs. Dr Nigel Watson in his review recommends, “every Primary Care Network should be in partnership with, or become, a Training Hub, ensuring the place-based delivery of education and training in primary care for GPs and other staff working in general practice and staff aligned with the Primary Care Network” (Partnership Review 4.51 p31). They are to be the new voice of general practice. “Every Integrated Care System will have… full engagement with primary care, including through a named accountable Clinical Director of each Primary Care Network” (LTP p30). They will be responsible for health outcomes. “Primary Care Networks will from 2020/21 assess their local population by risk of unwarranted health outcomes and, working with local community services, make support available to people where it is most needed” (LTP p17). They will also be encouraged to reduce expenditure. “We will also offer Primary Care Networks a new “shared savings” scheme so that they can benefit from actions to reduce avoidable A&E attendances, admissions and delayed discharge, streamlining patient pathways to reduce avoidable outpatient visits and over-medication through pharmacist review” (LTP p15). How is the move to Primary Care Networks going to happen? Well I suspect we will find out more when the new GP contract is finalised. For now, the LTP says, “As part of a set of multi-year contract changes individual practices in a local area will enter into a network contract, as an extension to their current contract, and have a designated single fund through which all network resources will flow. Most CCGs have local contracts for enhanced services and these will normally be added to the network contract” (LTP p14). In 2019/20 CCGs are required, “to commit a recurrent £1.50/head recurrently to developing and monitoring Primary Care Networks so that the target of 100% coverage is achieved as soon as it is possible and by 30 June 2019 at the latest. This investment should be planned for recurrently and needs to be provided in cash rather than in kind” (19/20 Planning Guidance p17). It remains to be seen if that sets a “running cost” of £45-75K per network (assuming 30-50,000 population), or whether it is a starter fund with more to be added later. One place we might find out is in the primary care strategy that every ICS or STP must have in place by 1 April 2019. This strategy is to set out, “how they will ensure the sustainability and transformation of primary care and general practice as part of their overarching strategy to improve population health… This must include specific details of their: local investment in transformation with the local priorities identified for support; Primary Care Network development plan; and local workforce plan” (19/20 Planning Guidance p17). The ambition for fledgling Primary Care Networks, that in some places do not even exist yet, is breath-taking. They are clearly a crucial building block in the design of the new system for the NHS. Whether they can live up to the expectations remains to be seen, but they represent a huge opportunity for general practice. Like them or love them, because even funding is being channelled through them, they are a trend that will be almost impossible for general practice to ignore.